Love Oreos? 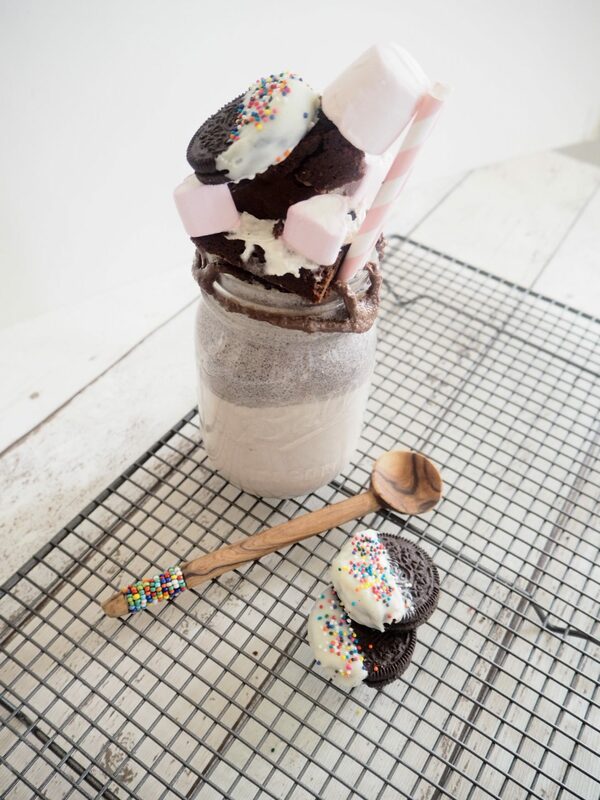 Well this Oreo megashake is so indulgent and the best thing is you can layer it as much as you want and make it as naughty as you want. It is the perfect treat to have for dessert. Blitz the vanilla ice cream, milk and 4 Oreo biscuits. Fill up a jar/glass with the mixture right up to the rim. Layer the rim with some brownie chunks. You can use pre-bought brownies or make some. Here is my Recipe if you want to make some spiced Nutella ones. Drizzle some chocolate sauce all over the rim. Now add some whipped cream on top in a big layer. Nestle an Oreo biscuit in the middle. You can use a plain one or an Oreo dipped in white chocolate. Here is my recipe. Place some marshmallows all around.